On the last day of her solo exhibition Bodies of Work at LENTOS the artist Katharina Gruzei presents her publication of the same title. 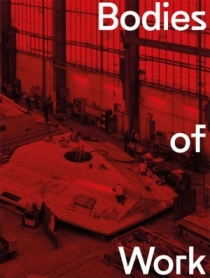 In her 224-page book with 140 color illustrations she deals with the work in Austria's last Danube shipyard (ÖSWAG) and accompanied, among other things, the construction of a large ferry ship. In Katharina Gruzei's pictures worker and workpiece merge into one. Her pictures open up spaces of association that reach into the genre of science fiction.